Exhaust Valve, 1.570'' x 5.024'' o.a.l. Intake Port Gasket, 1.400'' x 2.250'' w/ 3/8'' radius Fel-Pro 375-1262R - DO NOT PORT MATCH Intake Manifold to Fel-Pro Gasket. Spring Pocket can be cut to 1.580, no deeper. The Best 20° In-Line Head You Can Buy! AFR's NEW 220cc Renegade Ford is a fresh addition to our lineup that adds quite a punch to our already formidable and proven 20° Ford Heads. These new 220cc flow a massive 340 CFM, averaging an 11 CFM increase from .200''-.800'' lift over our previous best in spite of its 5cc smaller intake runner. 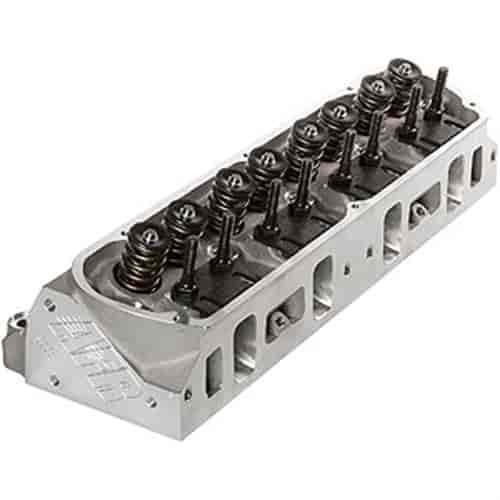 This is the best small block Ford 20° inline head you'll find to provide huge horsepower to out run your competition. With the largest intake and exhaust runner volumes for our in-line Ford line up, these are the ultimate for NMRA Renegade or Hot Street classes. With lightweight 8mm diameter stem 2.100'' intake valves and 1.570'' exhaust valves these heads move massive amounts of air. Combustion chamber volumes are available in 58cc or 69cc. Exhaust ports are 80cc and bolt pattern are raised .375'' (3/8'') higher than stock, this rarely affects header or chassis fitment. AFR's new 220cc is the perfect choice for 347-427ci windsors engines operating from 4500 RPM and upwards. AFR's trademark 3/4'' thick cylinder head deck makes them ideal for heavy nitrous or blower applications. . Installation Note: 2.100'' valves will require aftermarket pistons notched for valve clearance. How do I place a order on these with the upgraded springs .